Global Commercial Boiler Market size in 2017 was valued over USD 12 billion and annual installation is set to surpass 300 thousand units by 2024. Growing need for space heating and hot water across cold regions coupled with increasing demand for high efficiency heating systems will drive the global market growth. Government initiatives toward renovation and substitution of inefficient building infrastructures will further enhance the industry size. For instance, the European Union introduced Energy Performance of Buildings Directive, which aims to achieve zero carbon emissions from buildings by 2050. Growing focus toward minimization of Greenhouse Gas (GHG) emissions coupled with enactment and strengthening of emission standards are some of the paramount factors which will drive the demand for energy efficient commercial boilers. The respective governments and investors are continuously focusing toward deployment of energy efficient devices and the development of economically and ecologically sustainable commercial infrastructure. For instance, in 2017, the European Commission (EC) launched a Voluntary Reporting Framework Level(s) toward improvement of sustainability of buildings. Gas-fired commercial boiler market is projected to witness gains over 3% by 2024. Lower carbon footprint, and comparatively lower operation & maintenance costs will enhance the product deployment. Ongoing investments toward expansion of natural gas infrastructure across the globe will further boost the industry growth. For instance, the Government of Canada announced an investment of USD 7 billion toward expanding the capacity of Nova Gas Transmission Ltd. to 2.5 Bcf/day by 2021. Oil fired commercial boiler market is predicted to surpass annual installation of 100 thousand units by 2024. Lower Annual Fuel Utilization Efficiency (AFUE) and relatively higher carbon emissions along with government initiatives to limit the GHG emissions may restrict the product deployment in medium term. However, better accessibility to fuel and lower initial cost are some of the key factors that will keep the product competitive in the boiler industry. Healthcare commercial boiler market will witness a strong growth on account of growing demand for hot water for sterilization of medical instruments, sheets and for space heating. Rising government and private investment toward expansion and modernization of healthcare infrastructure will further fuel the product demand. According to the U.S. Centers for Medicare and Medicaid Services, total expense on healthcare in 2017 was estimated to be USD 3.5 trillion, which is projected to reach USD 5.7 trillion by 2026. Rapidly growing IT industry, along with shifting trends from agricultural to industrial economy has necessitated the construction of commercial spaces which will in turn drive the market growth. As per the U.S. Department of Energy (DOE), commercial structures consume over 7 trillion joules of site energy annually. 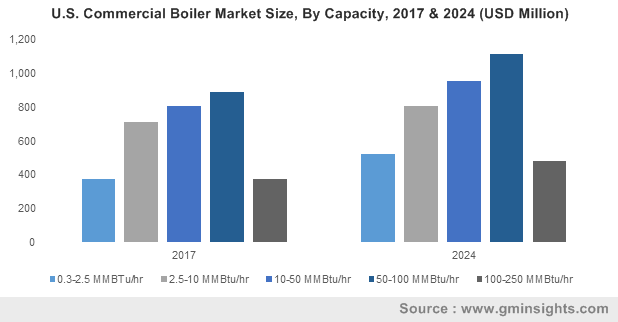 0.3-2.5 MMBtu/hr commercial boiler market is anticipated to surpass USD 1.5 billion by 2024. Easy installation along with cost effectiveness over its available counterparts will drive the industry growth. These products are widely deployed across offices, retail stores, healthcare and lodging for heating applications. 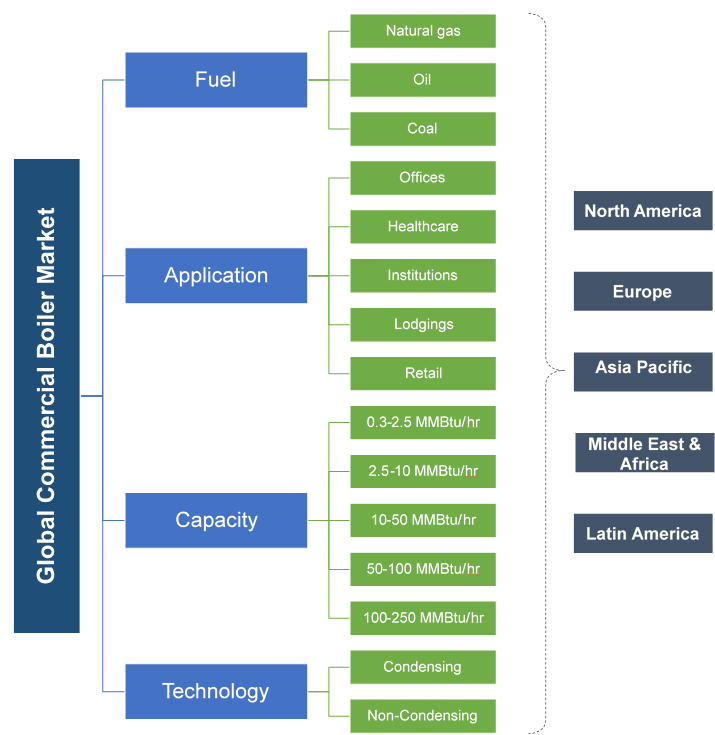 2.5-10 MMBtu/hr commercial boiler market is projected to grow over 2% by 2024. Shifting trends toward energy efficient condensing boilers coupled with modernization and expansion of commercial centers will boost the product penetration in coming years. Rapid growth across the service sector including retail and hospitality will further complement the business landscape. Condensing commercial boiler market will witness robust growth subject to government mandates to reduce the greenhouse gas emissions. For instance, the U.S. Environmental Protection Agency introduced the National Emission Standards for Hazardous Air Pollutants (NESHAP) toward regulation of greenhouse emission across commercial and industrial centers. Its potential to fulfill the requirements of an energy efficient HVAC system will further augment the industry growth. Lower initial cost and capability to attain high operating temperature are some of the key features that will fuel the non-condensing commercial boiler industry growth. The product’s ability to operate under adverse climatic conditions along with compact size and minimal maintenance requirements will further complement the business landscape. The U.S. market will witness strong growth on account of stringent federal legislatives to limit carbon footprints from commercial infrastructures coupled with investments toward replacement and upgradation of conventional heating units. The federal government in conjunction with the respective state agencies has introduced a range of measures to curb the rising air pollution. For instance, the Environmental Protection Agency (EPA) has adopted the New Source Performance Standards (NSPS), for commercial steam boiler, which comprise the emission standards for air pollutants including particulate matters, SO2 and NO2 from boilers. China market will witness robust growth owing to rapid urbanization and investments toward development of commercial centers. As per CBRE’s China Investment Strategy Report, commercial property business will grow to USD 39 billion by 2020, witnessing an 45% growth from 2016 level. Key players across the global market comprise Viessmann, Ferroli, Atlantic, NIBE, Fulton, Babcock and Wilcox, Hurst, Clayton, Bosch, Cochran, A.O Smith, Miura, Weil-McLain, Johnston, Rite, Lattner, Precise Boilers, Northwest, victory, PB Heat, Burnham, Cleaver-Brooks, Slant/Fin, Parker, Vapor Power, and Mitsubishi along with others. Major companies active in the business are concentrating toward development of new products and inorganic growth ventures as their growth strategy. For instance, in March 2016, Cleaver-Brooks announced the acquisition of Camus Hydronics, a developer and manufacturer of condensing hydronic boilers. The acquisition will strengthen the company’s position in the boiler industry. Boilers have prime application across various commercial establishments including offices, lodgings, healthcare facilities, institutions and retail for hot water and steam generation. Rapidly growing commercial sector along with stringent government legislatives toward limiting CO2 emissions will drive the global market size.